The only state with that shares a border with only one other state, I have probably spent more time in Maine than any other state besides New York and New Jersey, my two home states. In fact, Maine borders more Canadian provinces (Québéc and New Brunswick) than states (New Hampshire)! The only other state that can make that claim is Alaska, which doesn't border any states. My dad is in the New York Air National Guard (full-time, he's not just a weekend warrior). One of the perks was that we got to go to a Navy base in Winter Harbor. The base serves as a home for Navy personnel who man radar stations that monitor the North Atlantic. There are no military operations on the base itself, but it has a lot to offer in terms of MWR (that's Morale, Welfare, and Recreation to you civilians). When most people think of Acadia National Park, they think of Mt. Desert Island (pronounced like the snack and not like the dry sandy place) and the town of Bar Harbor (pronounced "Baa Haabaa"). But a few miles to the east (but about 35 miles by car) off of ME-186 is the Schoodic Point section of the Park. Past the towns of Gouldsboro and Winter Harbor is the entrance to the Park Loop Road. It's a few miles to the Point, but it is a very spectacular ride. Once you reach the park entrance it's one-way. As you reach Schoodic Point the road becomes two-way once again and passes the entrance to Winter Harbor NSGA. Schoodic Point is rocky, and you can literally lose hours just watching the surf pound the coast. There are also plenty of seagulls around for all of the leftover bread you have. I have been to Schoodic Point about eight times, and we always tried to coincide our trip with the Winter Harbor Lobster Festival which falls on the second weekend in August. The Park Loop Road outbound goes through along the shore a little bit, and you can climb to the top of 440-foot Blueberry Hill. I always liked the inbound road better. When you come out, if you make a right at Chipman's onto ME-186 eastbound, you'll pass through the town of Prospect Harbor, home of Beach Cliff Sardines. If you're planning a trip to Acadia National Park, don't forget to check out the Schoodic Point section. This sign is along US-2 on Maine's border with New Hampshire (I guess that's redundant). We had just abandoned our campsite which we called Fort Necessity, just over three clicks down the Nineteen Mile Brook Trail near where the Carter Dome Trail branches off in White Mountain National Forest. We just couldn't keep a fire going and with the temperature nearing single digits we thought it best to abandon camp. Just like when we left the White Mountains by way of Vermont a few days later, I dragged Vanya into Maine so I could get my photos. At least he could cross Maine off his list of visited states, not that he's keeping as serious a list as I am. It was number 16 for him. This sign is about eight or 10 miles east of the town of Gorham, New Hampshire. Even though this is a sparsely inhabited region, I was hoping for a large sign since this was after all on a US highway. It's small, just about the size of my West Virginia sign. I don't remember if there's a sign on I-95 between Kittery, Maine, and Portsmouth, New Hampshire, or if there is, how accessible it is. The border at that point is crossed by I-95 on the Piscataqua River Bridge. 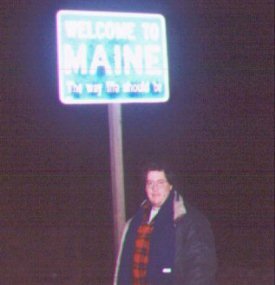 The last time I took I-95 into Maine was 1996, and if I remember correctly the sign is in the median. If anyone can confirm that on I-95 there is an accessible sign (meaning that one could pull over and pose in front of it, and hopefully not on a gantry or median) and that it is much better than the one I have here, please let me know. Note: In 2002, the U.S. Navy closed the Winter Harbor NSGA installation after 85 years of service. Naturally, after getting that picture, it was time to head to Augusta. 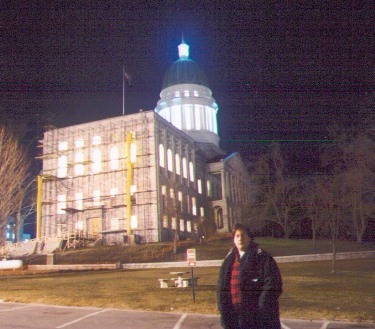 I had been in Augusta several times en route to Winter Harbor, so I knew where the capitol was. With my trusty Rand McNally by my side, I headed off east on US-2. There wasn't a perfectly direct route from where we crossed to Augusta. I pulled off an plotted a route, but the signage in some locations failed me. For example, I think it was ME-26, there was a sign for 26 East, but none for west. And since this junction was at a three-way intersection, I had no idea if 26 West was multiplexed from that intersection on, if the intersection was the end of a multiplex with 26 West, or if 26 West was on either the next left or the previous left. Anyway, I plodded on, with Vanya sleeping in the shotgun seat. We came into one town where I tried to follow the route as best I could, and I soon found myself on a dirt road. This dirt road got bumpy at points and the rough ride woke Vanya up. Knowing how much I pride myself on my navigational skills, Vanya didn't flip out; he merely said "I'll go back to sleep and spare you any embarrassment." After a few miles of this, I capitulated and turned back. Vanya never mentioned this again; he would just cite this as the basis for his opinion that "Maine is weird." Eventually I got to a T-intersection with ME-4, which is a main drag. I was west of Augusta, but since a lake separated me from my destination, I had to go north or south. I chose north. After barely a quarter mile I double-checked my Rand McNally and turned around. I took ME-4 south to US-202 east into Augusta. Augusta is middle-of-the-road compared to other New England capitals. It's smaller than Hartford and Providence, but it's no Montpelier or Concord, either. Since it was almost midnight, we couldn't see the rest of the town. But across from the capitol there's a hill that goes down to the Kennebec River and a couple of bridges. It's a quaint vista during the daytime. I remember as a child, seeing Maine's capitol for the first time, thinking, "How come it doesn't look like the one in Washington, D.C.?" Maine and Rhode Island have the only capitols in New England that prominently feature columns on the rotunda. All things considered, I would say that Maine's is the prototypical state capitol dome. After snapping the pic, we got on I-95 headed back to Boston to retool for our second attempt at Operation Nye ("Nye" is the home county of radio talk show host Art Bell, and coincidentally the acronym for "New Year's Eve"). On the Maine Turnpike we were able to pick up WABC-AM from New York, as AM carries incredible distances at night. We listened to Lynn Samuels who was subbing for Curtis Sliwa. Samuels is one of the few liberals on WABC. The other thing she's noted for is, well, she doesn't have a Fran Drescher voice, Fran Drescher has a Lynn Samuels voice. As 1 AM rolled along we got to experience listening to Art Bell while driving on the interstate in the middle of the night. Art's show is very popular with long-haul truckers. Make sure you check out Schoodic Point! This page loaded in 2.450 milliseconds.